As 'Seasons in the sun' turn one, I wanted to have something special here. Owing to some personal commitments, we couldn't really celebrate our turning one on a grand scale. It was therefore planned to 'fêter' at a convenient time and that hour has arrived. We wanted to celebrate not just with cake and candle but also with something that we had never showcased here. For the very first time, we shall have a home tour of a dear friend, Pryia. Yes, a home tour! You heard it right! Before I hand it over to her and take a virtual trip of her absolutely colourful home, let me say a few things about her and our friendship. Priya better known as Peeli to me and to all our bunch of virtual friends, is someone whom I met online. We were part of a common group and hit it off well right from the beginning as we had the same decor bandwidth! Once in a while I would see her gorgeous home in 'bits and pieces' and this would actually make me crave for more. 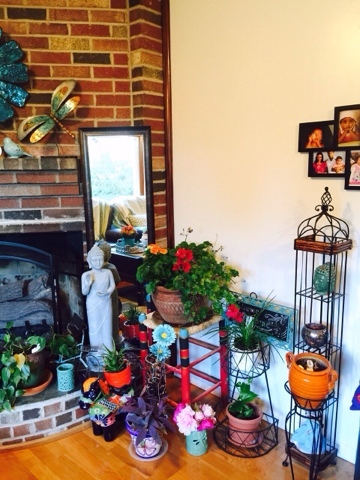 I wanted to see more of her home which she has done up so aesthetically. And now I hand the reins over to Peeli who will carry forward from here. 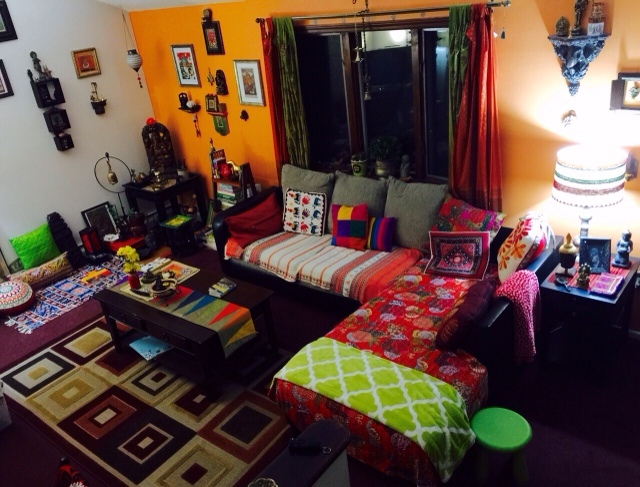 Get ready to enter Peeli's vibrant and colourful home that exudes warmth and only warmth! Hi, I am Priya and live with my husband dear and our sweet little girl in the beautiful New England area in US. I love where I live, feel fortunate to be able to be where one can experience the contrasting beauty of all the seasons - the vibrant splash of bright flowers in spring, the lush green but not too warm summers sprinkled with crystalline showers , the crisp Fall with fiery red leaves blanketing the yards and downy fluffy snow covering everything that we can see all around for at least 3-4 months a year.. I am an artist following the call of my heart and have a line of colorful jewelry that I retail thru my online store.. and I also work at a regular IT job as a Business Analyst during the day. With the demands of these two very different lines of work and making time for household stuff too, life gets pretty hectic indeed.. I am the decor fanatic in our home, my husband and daughter tolerate it and occasionally comes up with startling insights that help put things together, otherwise for the most part they leave me alone with my decor trials (and errors too). I try to keep our indoors warm and cozy and since the house we live in has an abundance of dark wood accents that we have not decided what to do with yet; I feel the warm colors are the best to make them work for now. 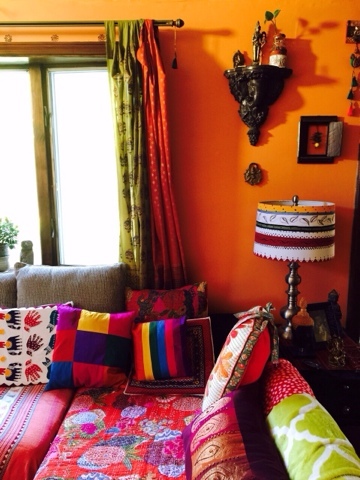 In our home, there probably is an overdose of shades of red and orange..I love to layer fabrics, pepper the walls and surroundings with sculptures or artwork..
And Peeli, I love it, too! I do not have any specific design mantra as such.. anything I love and that will fit into the current framework of our home goes..If you still ask me for one, it will have to be - ' Don't be afraid to experiment’. I probably could never live in a ready-made designer home as it would never satisfy me if I could not change things around..decor for me is an evolving concept.. replacing one little sculpture from here to there, placing a new planter in the corner earlier filled with books..taking away a picture and substituting it with a wall hanging.. it is always a work in progress and I think a great stress buster for me ! For the main or larger pieces of furniture we tend to keep to neutral shades and styles so they can fit into any color or decor style we choose.. Brass or gold decor pieces will go with most warm colors.. The mid sized pieces, like coffee tables or lampshades or even photo frames, can always be jazzed up to meet what theme or color way we have going on at the moment. If nothing needs to change, I change up the knobs of the coffee-table drawer handles to tie it in with the whole style. Lucky for me and my penchant for colors, the world is more or less a Global marketplace now; stores like HomeGoods/Anthropologie/Vivaterra/Ten Thousand Villages ,etc,and not to mention WorldMarket along with a host of even online Boutiques give us a sampling of our Eastern ware, both colorful and rustic ! 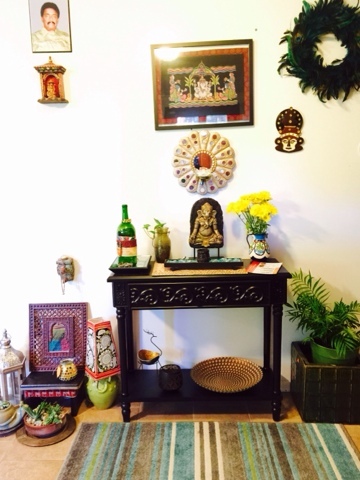 !..Almost all of my very Indian stuff at home have been bought in US .. Shipping from India is mostly stressful for me and honestly, patience to wait for anything I need, has never been my strong suit :). So DIY is the way to go many times.. Regular store bought finds get a vivid Indian look with just some acrylic paints/fabrics and/or some of my own clay creations.. My favorite pics on the walls get photo mat backgrounds based on the color schemes of my choice and colorful pillows / placemats and runners … and that’s all it takes to bring about a room makeover ! 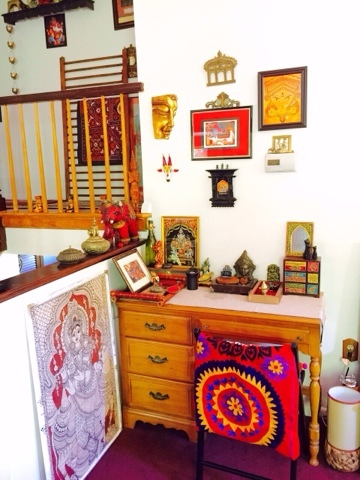 I love collecting Ganesha and Buddha sculptures too, large and small. Also fabrics, Kutchi,Suzani, etc, when I can grab them up. 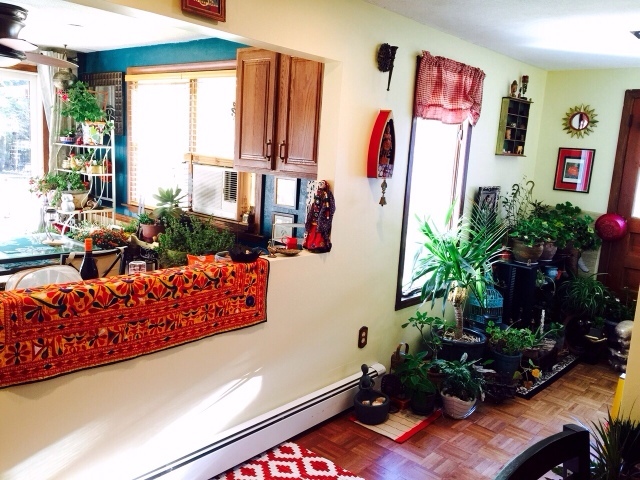 Also love having a lot of indoor plants.. 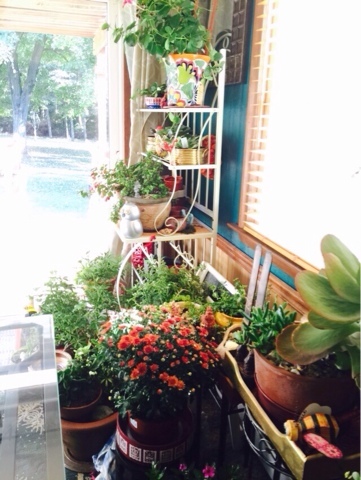 Most of my plants stay out in Summer and come indoors in Fall (So you see a bit of a crowd indoors in these pictures ) .. I love having at least a few of them in at all times..They bring lot of positive energy into our homes and hearts ! That was certainly some tips from the designer herself! 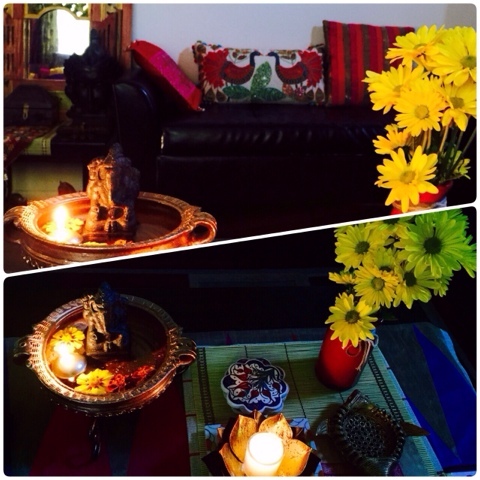 I loved your decor mantra, the tips you shared with us here and your attitude! I am sure all our readers, too, enjoyed every bit of this colour-laden journey. Look at that colour palette! And who would not want a space like this? Perfect for a good read with some chai! Pretty knick knacks tastefully displayed! I love that Suzani! And can we miss this green corner? My favourite ! Splash of colour amongst the pretty foliage! I am in love with all these corners! 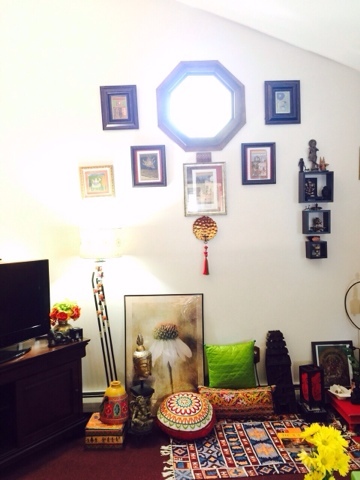 The neutral walls seem to be the perfect backdrop for the pops of colour in the form of paintings and artifacts! 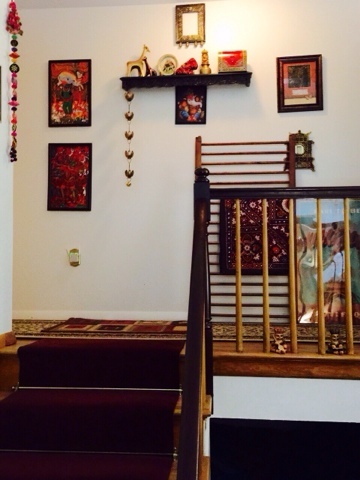 A closer view of the landing....this homeowner loves fabrics of all kinds!Look at way she has displayed the Kutchi wall hanging! This home speaks and breathes colours! Love those pretty patterned cushions. Brass decoratives, candles, urlis...the homeowner's love for traditional and ethnic decor elements is clearly visible. The bookcases displaying some of the handpicked artifacts. 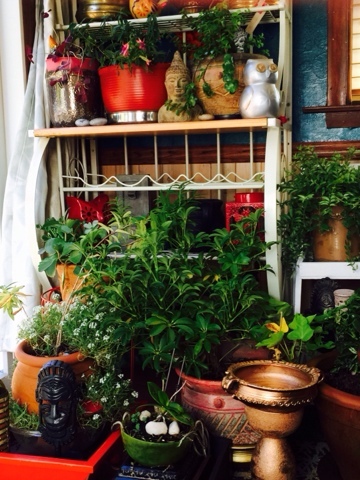 A splash of green makes this corner come alive! Peeli had sent me all these photographs and i had intended to use just a few. But i could not resist myself and wanted to use all of them! After all, i couldn't have been partial to the others, could I? I am sure you would have enjoyed this colourful tour as much as I have enjoyed putting this post up. We would love to hear from you. And now, it's time to log out. I shall be back soon with another interesting place. Until then, stay well and have a great time. Enjoy the festivities! 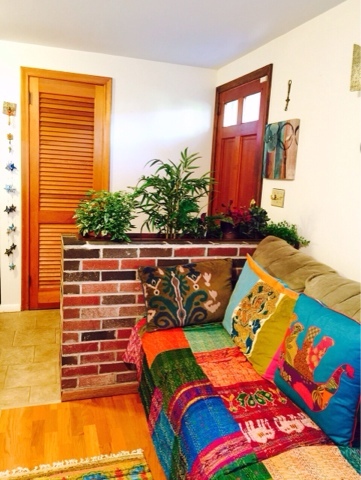 Kudos to you Vandana, you fulfilled my wish to see this home. Absolutely stunning and gorgeous home Priya. Filled with color and personality, just awesome! 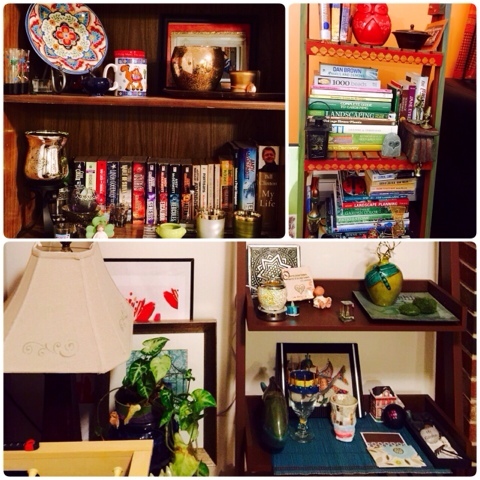 I am so glad you liked it, Disha:-).....and it is a home filled with sunshine colours! Such a beautiful home!!!! Pop of colors everywhere!!! Thank you for sharing with us Vandana!!! Glad you liked it Samidha! And thanks for stopping by! Thanks Asha:-)...pleasure is mine to see you after a long time! And am glad you enjoyed Peeli's home! Thank you so much, Rama! :-).... Thanks for being so appreciative! Congrats! and Cheers!! for blog anniversary :) Happy Blogging. 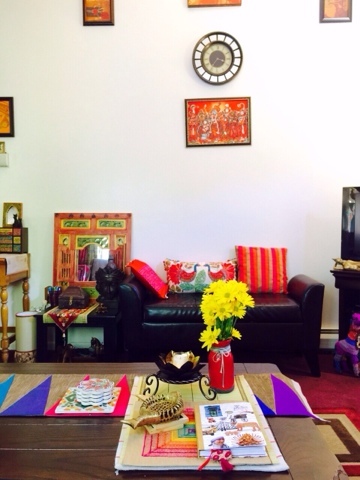 A vibrant home, thanx for touring us. Can't take my eyes off from your house Pryia, the green corners are an absolute wonder. Thanks for sharing Bandana ! Thanks so much for stopping by and being so appreciative:-).... Priya, Peeli to me, certainly has a wonderfully colourful home! Lovely play of colours. Not many cancarry it off the way you hv peeli. Vandana this is cool. I look forward to the nxt one too! Thank you so much everyone:) and V:) thank you for the opportunity!!! 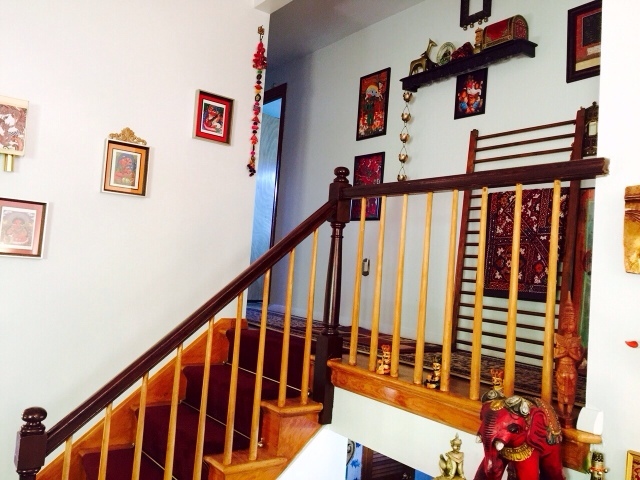 Beautiful home Priya with lot of Indian touch in each corner. Thanks Bandana for sharing with us. Thanks Vasudha! I am glad you liked Priya's home. It is a riot of colours! Loved sharing it with you.